Differentiation therapy shows promise for reversing type 2 diabetes in animal model. Scientists at the University of British Columbia and Janssen LLC have shown for the first time that Type 2 diabetes can be effectively treated with a combination of specially-cultured stem cells and conventional diabetes drugs. The opensource study published in Stem Cell Reports, holds a much broader potential because Type 2 diabetes accounts for more than 90 per cent of diabetes cases. Type 2 diabetes usually arises in adulthood, often stemming from poor diet, lack of exercise and obesity. Unlike Type 1 diabetes, in which insulin production is largely absent, Type 2 diabetes results from the body’s cells reduced ability to respond to insulin. As a result, sugar (glucose) accumulates to toxic levels in the blood. Almost 400 million people worldwide have diabetes, and it’s the eighth leading cause of death. It is more common in developed countries and has exploded in frequency during the past few decades due mostly to decreased activity levels and worsening diets. From 1999 to 2009, the prevalence of diagnosed diabetes among Canadians increased by 70 per cent. The team state that the cheapest, simplest way to treat type 2 diabetes is through diet and exercise, but this alone is not always effective. Several orally-administered drugs enhance insulin production or improve the body’s sensitivity to insulin, but can lose their effectiveness over time and carry various side-effects. Many patients are put on a regimen of self-injected insulin, but dosing can be difficult to calibrate, and it can promote weight gain. U.S. and Canadian regulators have approved clinical trials of stem cell treatments for Type 1 diabetes; the first patient received a transplant in October. In the current study the team simulated Type 2 diabetes in mice by putting them on a high-fat, high-calorie diet for several weeks. The researchers then surgically implanted pancreatic-like cells that had been grown in the laboratory from human stem cells. The data showed that the mice that received a combination of the cells with one of three diabetes drugs became as ‘glucose tolerant’ as the healthy mice, meaning they were able to keep their blood sugar in check even after ingesting a sugary meal. In contrast, a group of mice with simulated Type 2 diabetes that received the drugs but not the transplants remained glucose-intolerant. The team explain that being able to reduce spikes in blood sugar levels is important because evidence suggests it’s those spikes that do a lot of the damage, increasing risks for blindness, heart attack, and kidney failure. The combination therapy also caused the mice to return to a normal weight, the same weight as a healthy control group that had been reared on a low-fat diet. Their weight loss was intriguing, because some of the common diabetes therapies often lead to weight gain with the team adding that they need to do more studies to understand how the cell transplants lead to weight loss. The researchers are also investigating if higher doses of the cells, beyond the five million tested in this study, can achieve the same results without the need for additional drugs. The Morphology of Macroencapsulated hESC-Derived Pancreatic Endocrine Cells Is Similar in Grafts from Mice Fed a LFD or HFD. Representative immunofluorescent images of Theracyte devices at 29 weeks post-transplantation from mice fed 10% fat or 60% fat diets. (A) The majority of hESC-derived cells within devices from both diet groups were endocrine cells. The expression of synaptophysin (endocrine marker, red), CK19 (ductal marker, green), trypsin (exocrine marker, blue), and DAPI (nuclear marker, white) is shown. Scale bars, 100 μm. 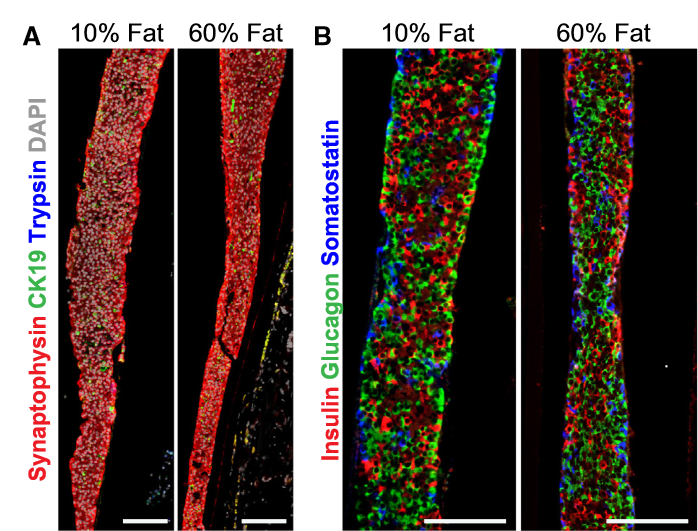 (B) The endocrine compartment was mainly composed of cells expressing either insulin (red, guinea pig antibody), glucagon (green, rabbit antibody), or somatostatin (blue, Ms antibody); scale bars, 100 μm. Higher-magnification images are shown in (E); scale bars, 50 μm. Treating Diet-Induced Diabetes and Obesity with Human Embryonic Stem Cell-Derived Pancreatic Progenitor Cells and Antidiabetic Drugs. Kieffer et al 2015.